The SMAP (Soil Moisture Active-Passive) is a NASA mission, which uses a combined radiometer and high-resolution radar to measure surface soil moisture and freeze-thaw state, providing for scientific advances and societal benefits. Direct measurements of soil moisture and freeze/thaw state are needed to improve our understanding of regional water cycles, ecosystem productivity, and processes that link the water, energy, and carbon cycles. Soil moisture information at high resolution enables improvements in weather forecasts, flood and drought forecasts, and predictions of agricultural productivity and climate change. SMAP will provide global observations of soil moisture and freeze/thaw state, together termed the hydrosphere state. SMAP hydrosphere state measurements will be used to enhance understanding of the processes that link the water, energy and carbon cycles, and to extend the capability of weather and climate prediction models. SMAP data is being used to quantify net carbon flux in boreal landscapes and to develop improved flood and drought prediction capabilities. The SMAP observatory employs a dedicated spacecraft with an instrument suite that was launched on an expendable launch vehicle into a 670-km near-polar, sun-synchronous orbit, with equator crossings at 6 am and 6 pm local time. The instrument suite includes a radiometer and a synthetic aperture radar operating in the L-band range (1.20-1.41 GHz) designed to make coincident measurements of soil emission and backscatter and sense the soil surface through moderate vegetation cover. These measurements will be analyzed to yield estimates of soil moisture and freeze/thaw state. The swath width of 1000 km provides global coverage within 3 days at the equator and 2 days at boreal latitudes (>50°N). The SMAP mission uses the same instrument concept as NASA's ESSP Hydros mission and builds on the risk-reduction performed for Hydros. SMAP science measurements will be acquired for a period of three years, and a comprehensive validation program will be used to assess the accuracies of the soil moisture and freeze/thaw estimates. The SMAP instrument architecture incorporates an L-band radar and an L-band radiometer that share a single feedhorn and parabolic mesh reflector. The reflector is offset from nadir and rotates about the nadir axis at 14.6 rpm, providing a conically scanning antenna beam with a surface incidence angle of approximately 40°. The reflector has a diameter of 6 m, providing a radiometer footprint of 40 km. The real-aperture radar footprint is 30 km, defined by the two-way antenna beamwidth. To obtain the desired high spatial resolution the radar employs range and Doppler discrimination. The radar data can be processed to yield resolution enhancement to 1-3 km spatial resolution. The science goal is to combine the attributes of the radar and radiometer observations (in terms of their spatial resolution and sensitivity to soil moisture, surface roughness, and vegetation) to estimate soil moisture optimally at a resolution of 10 km, and freeze-thaw state at a resolution of 1-3 km. The provision of constant incidence angle across the swath simplifies the data processing and enables accurate repeat-pass estimation of soil moisture and freeze/thaw change. The SMAP mission had been recommended by the NRC Earth Science Decadal Survey Panel for launch in the 2010-2013 time frame. 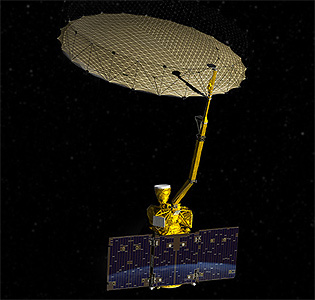 SMAP is based on the NASA ESSP Hydros (Hydrosphere State) mission that progressed through Phase A development until it was cancelled in 2005 due to NASA budgetary constraints. On 7 July 2015, SMAP’s L-band radar stopped transmitting due to an anomaly involving the radar's high-power amplifier (HPA). The attempts to reactivate the radar instruments proved futile and in September 2015, the radar was declared lost. The SMAP continues to provide data with the L-band radiometer.